It's almost December, and I can't believe how few Christmas-y projects I've done this year. So I'm fast trying to catch up today, even though I know many of you are celebrating a whole other, very special Holiday this weekend! For my friends South of the border, I'm certain many Thanksgiving celebrations abound today, and I wish everyone a very Happy and Blessed Thanksgiving. May your weekend be filled with family, happiness, gratitude and love. 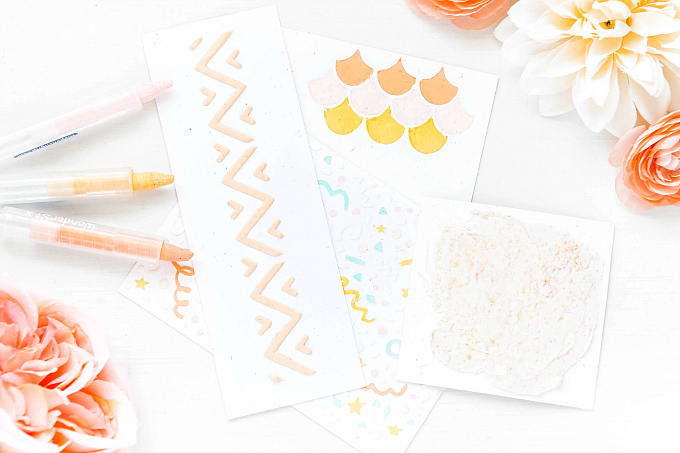 Today, I'm sharing a little pouch card and my favorite ways to use different types of felt! Before decorating this little pouch, I started with a basic piece of felt, cut and folded over and adhered with a bit of glue. Since I will be making piles of these pockets for Holiday gifting, being a little thrifty with the supplies will definitely be helpful :) So I thought this would be a perfect opportunity to chat all things felt, and talk about the main differences in quality, price, and usability between three of my favorite types. Just like all things, skimping on quality can result in some drawbacks, but the key is knowing when those drawbacks are ok and how to best make them work to your advantage! So I've summarized below a few things I like to keep in mind when deciding what type of felt to use and when - it's really what makes all the difference. If I am creating a simple pocket, I will usually use budget felt, especially if I know I will decorate it and cover most of the front with paper and other accents. Same goes if I know I am making a project in which I will be making multiples and thus will require large quantities of felt - such as invitations, party favors, or these little holiday treat pockets. I also like to use everyday or synthetic felt when I know for sure I won't be needing to die-cut any important details. Synthetic felt does not perform superbly with die-cutting, so I steer clear of it unless I am making these simple felt pockets, which only require a few cuts with my scissors. If I am decorating a card, or working on a larger project that will require some die-cutting, I will switch to using a blended felt that holds up a little better to fine detail cutting. This type of felt is still available at a great price point and I also love that this type of felt comes in larger (wider, to be specific) sheets, so it's perfect for die-cutting bigger items, such as scalloped envelopes, pockets and other bits that would be too difficult to cut freehand. Lastly, if the project is for a very special and important occasion, such as a wedding, I love using luxe products and swapping out my everyday felt or blended felt with something a little thicker, and more lush - such as premium wool felt. I also reserve wool felt for die-cutting intricate or small design details, such as flowers and other accents. Wool felt holds its shape quite well and is typically a little thicker than everyday or even blended felt. This helps keep the small die-cut pieces looking great by reducing fraying and keeping the shapes from getting disfigured. Ok now that you know my go-to felt for different projects, let's get back to this one! 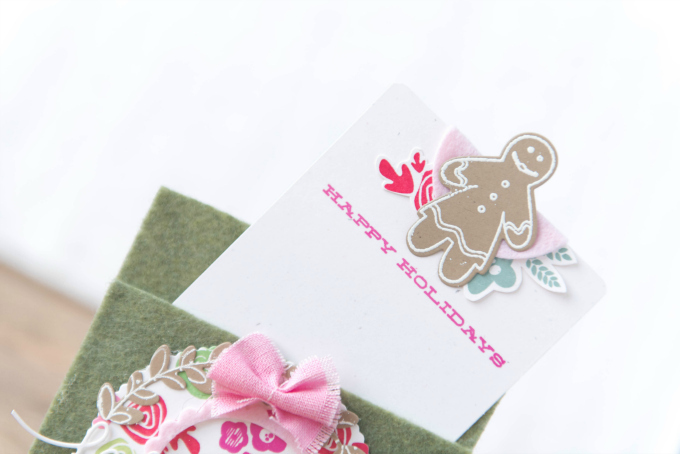 To make the insert card, I started with some basic cardstock and stamped a sentiment using Papertrey Ink's Gingerbread Lane. It's a discontinued stamp, but the dies are still available here. It might possibly be my favorite Holiday stamp, and I'm so glad I snatched it up before it went out of rotation. I stamped the sentiment in Rasbperry Fizz ink, and I used Ocean Tides and Pure Poppy to stamp the floral bits at the top. I used Mini Blooms from PTI for the floral accents, and Gingerbread Lane for the little gingerbread girl. To decorate the pocket, I stamped Mini Blooms in shades of Aqua Mist, Green Parakeet, Pure Poppy Berry Sorbet, and Raspberry Fizz. I used the Scene It Basic Backer die to die-cut the scalloped circle, and then the Rustic Wreath die to die-cut a kraft cardstock wreath, which I stamped and embossed in white, using the matching stamp set. I added a little scalloped felt accent, using Sweet Blush felt, which I die-cut using PTI's Limitless Layers dies, first cutting the larger scalloped circle, and then setting the smaller circle inside to create a fun little border. 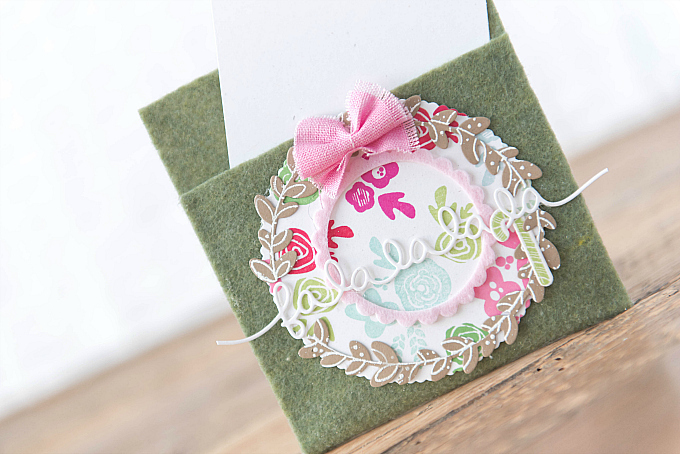 On top of the colorful circle, I added a die-cut sentiment using Lawn Fawn Fa La La La die. To the top I added a little fabric bow, and frayed the edges a tad for a softer look. This little pocket is all ready for mass production :) Once I have a pile ready, I'll be filling them with sweet notes and a few little treats to deliver just in time for the Holidays. I'm adding this original to the shoppe, and spreading some of the Holiday cheer to you too! Please let me know if you'd like more than just one, and I can create a custom listing for you. Thanks so much for visiting and once again a very Happy Thanksgiving Day! Hope you'll join me tomorrow!